Remember Pride and Prejudice and Zombies? As you know, Pride and Prejudice was originally a zombie novel, until Jane Austen's editors corrupted it and made it into a silly Regency romance novel. 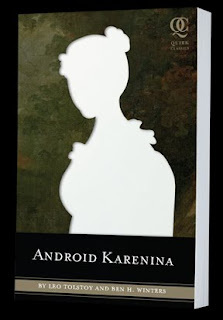 Well, Quirk Books, the publisher of that restored text, has likewise found the original manuscript of Leo Tolstoy's robot novel Android Karenina, which was again sabotaged by the publishing industry of Tolstoy's day as Anna Karenina. It will be published in June on the centennial of Tolstoy's death.